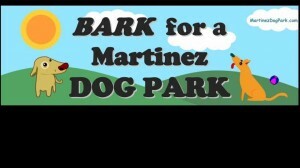 The Official Martinez Dog Park Group is a Registered Unincorporated Non-Profit Organization that is working together with the city to help maintain our new dog park where humans and canines can socialize and play freely. We actively represent and support the thousands of dogs and their families in Martinez who are currently benefiting from our new Dog Park. A fenced, secure, maintained dog recreation area provides a safe place for dog owners to play with their dogs off-leash. City parks are often busy and surrounded by busy streets, which make them not ideal for dog play. Open spaces like Briones are too wild and boundless for many dogs to roam safely. Martinez Dog Park Group (MDPG) Mission: “To maintain a fenced-in, off-leash dog park where well-behaved canine citizens can exercise in a clean, safe environment without endangering or annoying people, property or wildlife. To ensure that the location remains a beautiful, well maintained space open to all dog lovers and friends who are willing to uphold the park’s rules and regulations. MDPG views the Martinez Dog Park as a community project, in partnership with the City of Martinez, designed to satisfy the needs of dog-owners and non–dog owners alike.” The PROs of a Downtown Dog Park: ~Bring hundreds of people a week to downtown Martinez ~Increase downtown and city-wide commerce ~Reduce crime and loitering; Improve property values in the community ~Allows dogs to exercise and socialize safely. ~Promotes responsible dog ownership ~Provides an outlet for dog owners to socialize ~Promotes health and safety by giving dogs a designated play spot The upsides of maintaining a downtown dog park benefits more than just the thousands of dog owners in Martinez, a dog park will draw people and their spending money downtown. It discourages crime and vagrancy in the area. It increases property values in the community. And most importantly, it gives dogs a safe place to run free in a setting made for them. Consider the park an investment in the community that will pay off in health and happiness for all.